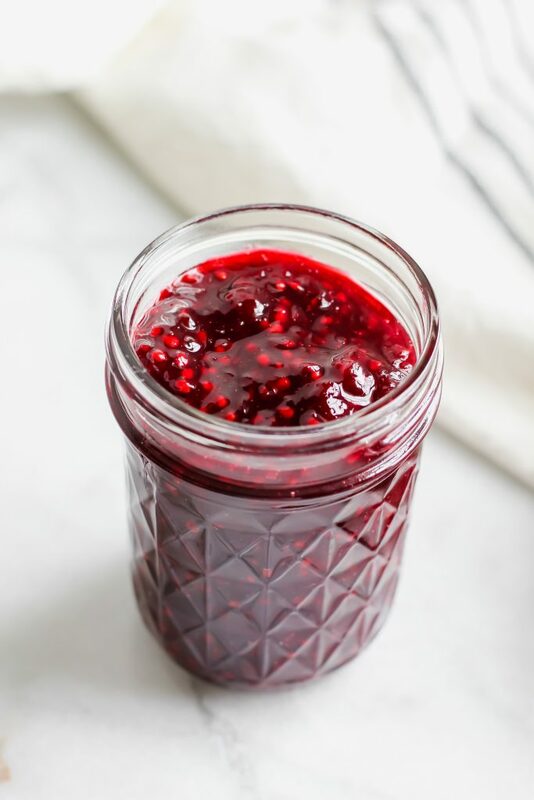 This blackberry jam is so delicious and easy! The perfect balance of sweet and tart and the best part? It’s SO easy and done cooking in less than 10 minutes! Perfect to slather on toast, muffins or any delicious breakfast food! It’s finally the beginning of berry season! It’s still a little bit early but I’ve been seeing lots of strawberries, blackberries and blueberries back on the produce shelves and they actually look GOOD! Like plump and juicy and delicious. So, when blackberries were on sale for 89 cents a pint this week at Aldi…I knew I must use them up! 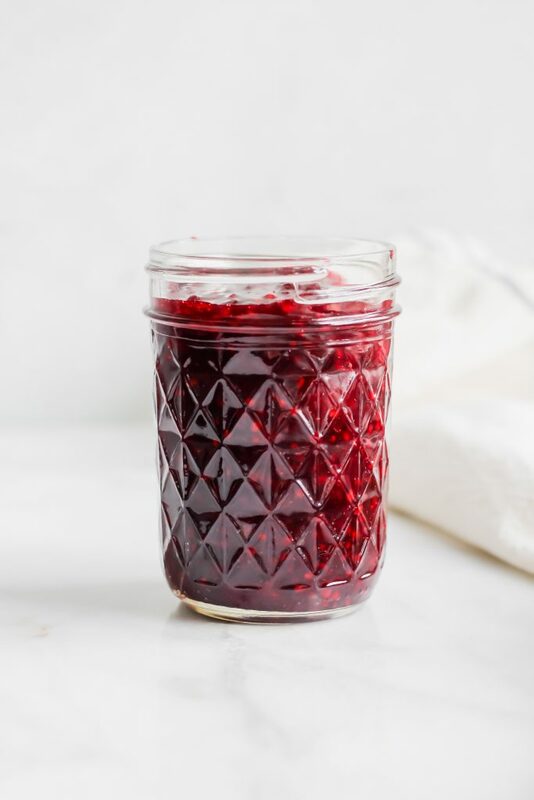 You know how store bought jams can be so sickeningly sweet? Like you feel like you are in a sugar coma after you eat breakfast? Not this one! 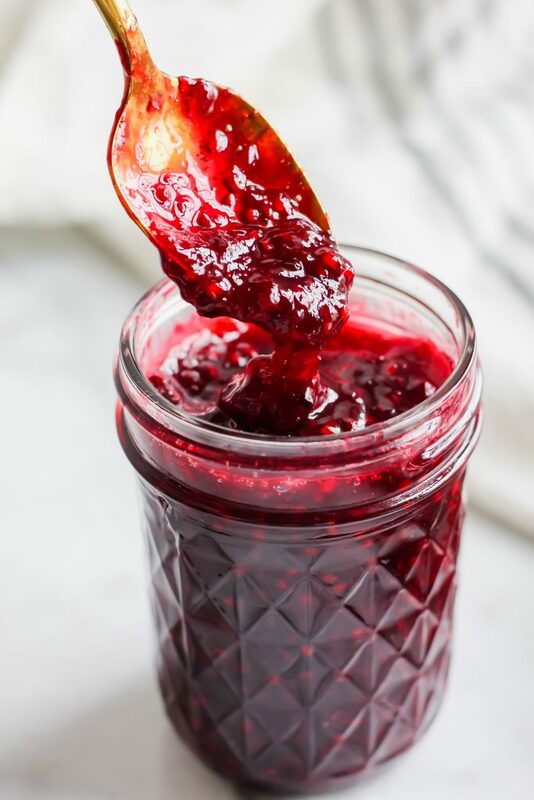 I love how this blackberry jam is the perfect amount of sweet and tart. I also decided to keep the seeds in the jam for an added texture but feel free to strain them out if you’re not feeling that vibe. It’s thick – but not like, too thick. It has some hunks of blackberry here and there for a chunky texture. Oh, and did I mention the good news? 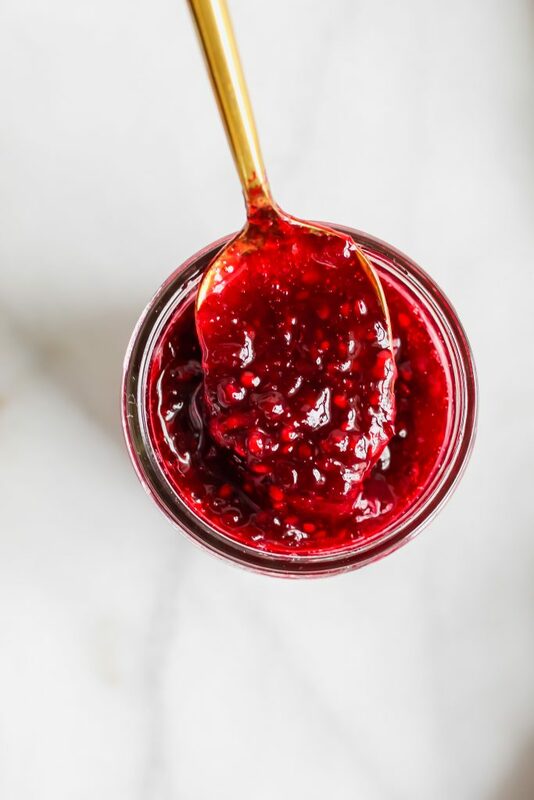 This 3 ingredient blackberry jam is not only delicious but IT’S SO SUPER EASY! Add the blackberries to a medium size pot and place it on the stove on high heat. While it’s getting hot, begin mashing the blackberries with a potato masher. 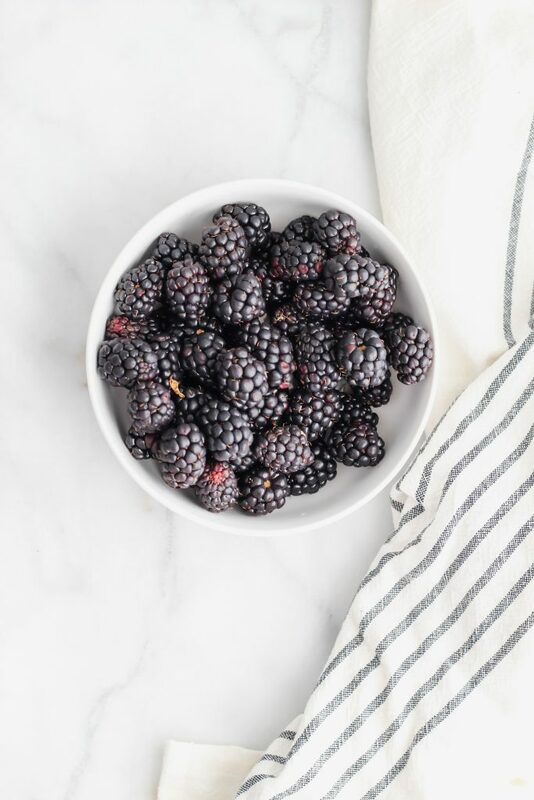 Be careful here – AKA don’t wear your favorite white t-shirt because there’s a large chance the blackberries will squirt all over it. Let it come to a boil, consistently mashing/stirring the berries. Once it has come to a boil, add in your orange (or lemon) juice and mix it in. Let it come to a rolling boil for one whole minute (I set a timer!). After, turn it down to medium high heat where it’s still boiling but not AS crazy as the rolling boil. Add in your sugar and stir in. Let it boil lightly for another 5 minutes or so, continually stirring and/or mashing if needed. It should thicken up a good amount by the time the 5 minutes is up. Take it off the heat and let it cool. As it’s cooling, it should thicken up even more! Once fully cooled, pour into a mason jar and keep in the fridge. It should keep for up to 6-7 days in the fridge – if it lasts that long! Enjoy this first taste of Spring, my friends! 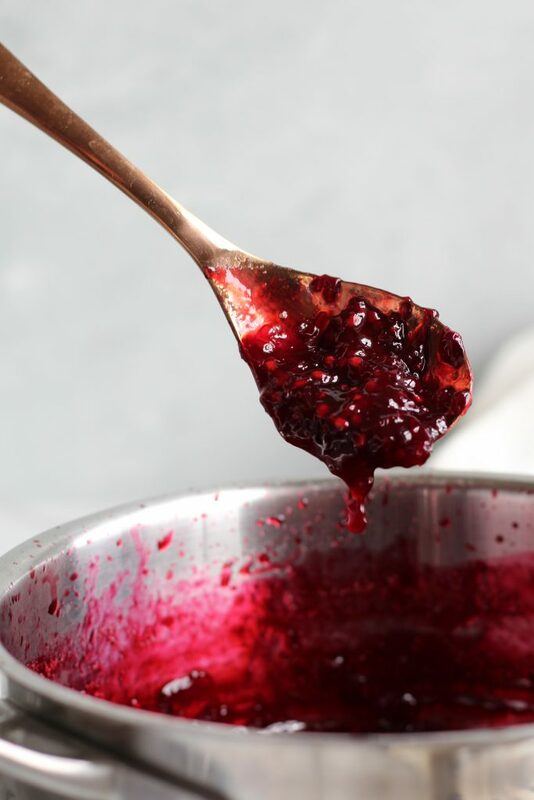 Yay for warmer weather and fresh, delicious blackberry jam! 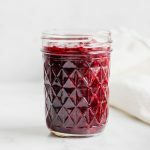 This blackberry jam is so delicious and easy! The perfect balance of sweet and tart and the best part? It’s SO easy and one cooking in less than 10 minutes! Perfect to slather on toast, muffins or any delicious breakfast food! Add the blackberries to a medium size pot. Place the pot on high heat and bring to a boil, mashing the berries as you cook them with a potato masher. You want the berries to be mostly smashed with some hunks of blackberries left in there. Turn down to medium high heat, with the mixture still boiling (just not as intensely) and add in your sugar and stir it in. Continue to boil on medium/high heat for 5 minutes until the jam begins to thicken. Take off the heat after about 5 minutes. It will still continue to thicken after you take it off the heat so don't worry! Let cool for at least 30 minutes and then place in a mason jar! Slather on bread, pancakes, waffles, french toast. Lasts in the fridge for 6-7 days. Enjoy! This recipe yields about 10 oz. of jam. If you'd like, you can strain the blackberry seeds out of the jam using a strainer. I preferred the texture of them in it, though! Uh hello! These pictures are simple and beautiful and I’m obsessed. Also please send me a jar of jam. Thanks, Jo! 🙂 I was happy with how minimal they turned out to really highlight the beauty of the jam! And TOTALLY! Gimme that address girl!